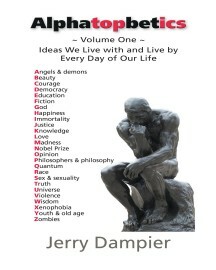 Alphatopbetics: Ideas We Live With and Live by Every Day of Our Life is a book inspired by the study of psychology, theology, history, science, and especially philosophy. Influenced by the Greek philosophers Socrates, Plato, and Aristotle, Jerry Dampier has combined life experience and informal discussions to arrive at the basis of Alphatopbetics. Keywords:- Ideas, Western thought, Learning, Philosophy, Thinkers, Wisdom, Knowledge.